From the heart of downtown Bogota, Sidestepper's new album hits fresh heights of block-rocking euphoria with its unique fusion of electronic dance beats and vibrant Latin sounds. 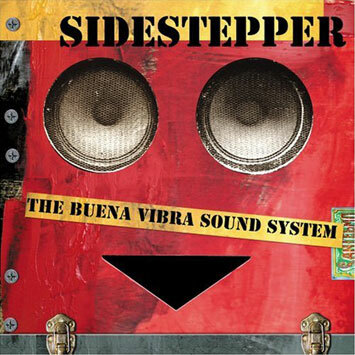 "The idea with Buena Vibra Sound System was to make a real party record," Sidestepper founder Richard Blair explains. "What we've tried to do is to erase the lines between being a live band and a sound system and to make real block party music with nothing precious about it." Buena Vibra Sound System celebrates ten years of the Sidestepper phenomenon. During that time Sidestepper's shows have become legendary - whether as a full-on live band or going out as as the Buena Vibra Sound System. In the process, Sidestepper has helped to transform the Colombian music scene, inspiring a generation of young beat scientists to marry Latin music with cutting-edge beats. "You could say Sidestepper is an idea of which I'm the curator," says Richard. "But I don't own the idea: I feel I've been entrusted with it. It's a platform for so much talent - and the new album takes us closer to the essence of the idea than ever before. " Today the Sidestepper sound has expanded far beyond its original fusion of classic salsa and club beats to take in everything from deep Colombian folk influences to hip-hop via cumbia, dancehall reggae, dub and even Afrobeat, layering infectious melodies and tingling harmonies on top of rock solid beats and fat bass lines. Initially conceived as a solo project, Richard was joined by Colombian songwriter Ivan Benavides as a key co-conspirator following the release of the first Sidestepper album in 1997. "In the beginning I was simply taking an essence of classic salsa or cumbia and adding all these other beats - fluid and funky, with lose clattering drum patterns that could readily be chopped and snipped and re-arranged," Richard says. "Then Ivan started adding vocal melodies and lyrics. He's been half of the Sidestepper sound ever since." Sidestepper's early success with such dancefloor classics as Logozo led to a deal with Chris Blackwell's Palm Pictures, and the albums 'More Grip', (2000) and 3am In Beats We Trust, (2003) followed. The next logical step was to constitute Sidestepper as a full-on live band. "I wanted the dynamic of playing live and so we assembled this extraordinary line-up of Colombian players," Richard says. "I's a very special group of people and it's a privilege to be on stage with them." When not performing as a full band, the Sidestepper experience can be witnessed rocking dance floors as the Buenavibra Sound System. "But it's still a live gig," Richard notes. "We use singers and MCs, drums and guitars as well as live electronics so the impact has the same dynamism. The whole idea is that you can't really tell if it's a band or a sound system. It's just Sidestepper. Djouls!!! Dont love the funky music no more at slsk? I go to colombia to play with richard blair & buena vibra soundsystem next 13/09 at gallera san miguel (bogotá)!! !